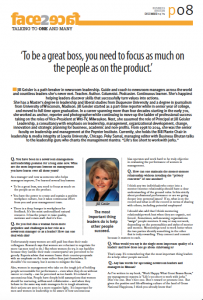 Work Happy: What Great Bosses Know | Jill Geisler's book for extraordinary leaders and productive, happy workplaces. The Newseum in Washington, DC, has launched The Power Shift Project, dedicated to fighting sexual misconduct and discrimination in media organizations. In light of so many scandals in media organizations and the courage of the #MeToo movement, the Newseum convened 130 expert voices in January 0f 2018. I was honored to serve as moderator of that summit. The message from that day was loud and clear: there's abundant work to be done. It was echoed in the official report from the summit, which I encourage everyone to read. The Newseum plans to produce numerous programs and instructional materials designed to address the problems. I've been tapped to guide these efforts and, with the blessing of Loyola University Chicago, have accepted additional responsibilities as the new Freedom Forum Institute Fellow in Women's Leadership. We've developed quite a community on the Facebook page I maintain for "Work Happy: What Great Bosses Know." It's here that I curate and post articles of interest to managers and aspiring leaders each day. As I write this, we have nearly 3,000 people in the group - and more joining every day. Just click on this link to get to the page, and "like" it to join. You'll get updated posts from me in your Facebook timeline. You can comment on the posts or just lurk, if that's more your style. 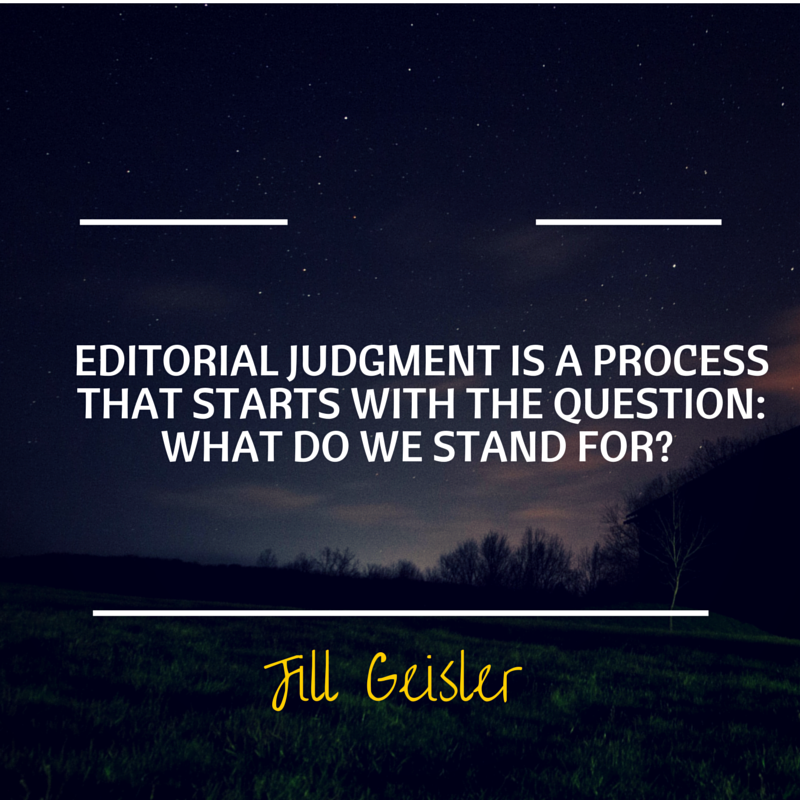 But I enjoy hearing reactions to the articles and how helpful you may find them. Social media lets us stay connected, wherever we are! 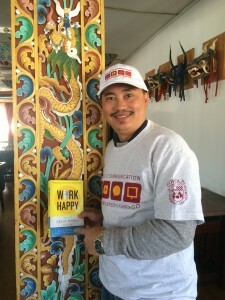 Comments Off on Join Me on the Work Happy Facebook Page – for Daily News! February 18, 2018 Comments Off on Join Me on the Work Happy Facebook Page – for Daily News! You can download the podcast series from iTunes U by clicking on this link. 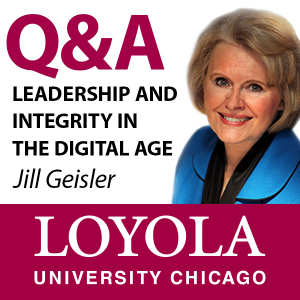 Loyola University Chicago and I have just launched my new podcast for managers and aspiring leaders - focused on leadership, communications and integrity in these fast-paced and changing times. Q&A: Leadership and Integrity in the Digital Age is available on iTunes U, the academic side of iTunes. Click here and a link will take you to the podcast home page on iTunes U, where you can subscribe. There are 20 episodes as we launch and I will be adding to the collection regularly. 1. How Will This Podcast Help Me Be a Better Leader? 2. Should Managers Be Facebook Friends with Staff? 3. What Forms of Communication Work Best During Change? 4. Should Leaders Ever Lie? 5. How Can I Build a Personal Brand without Shameless Self-Promotion? 6. How Can We Fight Burnout in an “Always-On” Culture? 7. What Does “Transparency” Really Mean for Leaders? 8. Should I Check the Social Media Posts of Job Candidates? 9. Is “Ability to Multi-Task” a Valuable Skill? 10. What Is the Best Medium for Communicating an Apology? 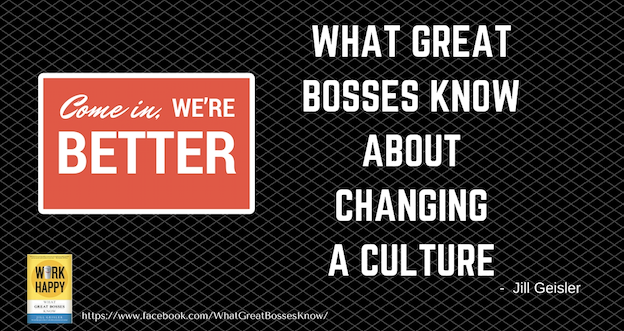 As you may know, my first podcast series: "What Great Bosses Know" has been downloaded millions of times. I'm delighted that the leadership at Loyola, especially the Dean of the School of Communications, Don Heider, invited me to build on that popular collection with this fresh series. Hope you enjoy it! 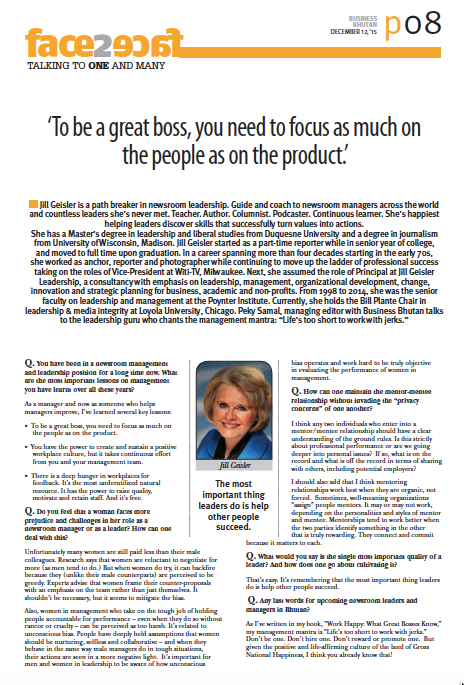 Comments Off on Jill Geisler’s New Podcast for Leaders on iTunes U! Welcome to the Kingdom of Bhutan! It's where I had one of my most fascinating teaching experiences. Bhutan has only been a democracy since 2008. 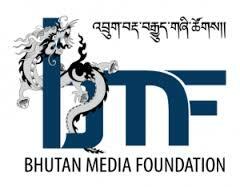 Television came to Bhutan in 1999! So, you can imagine the interest media organizations have in developing strong. smart and ethical leaders in the field of communication. 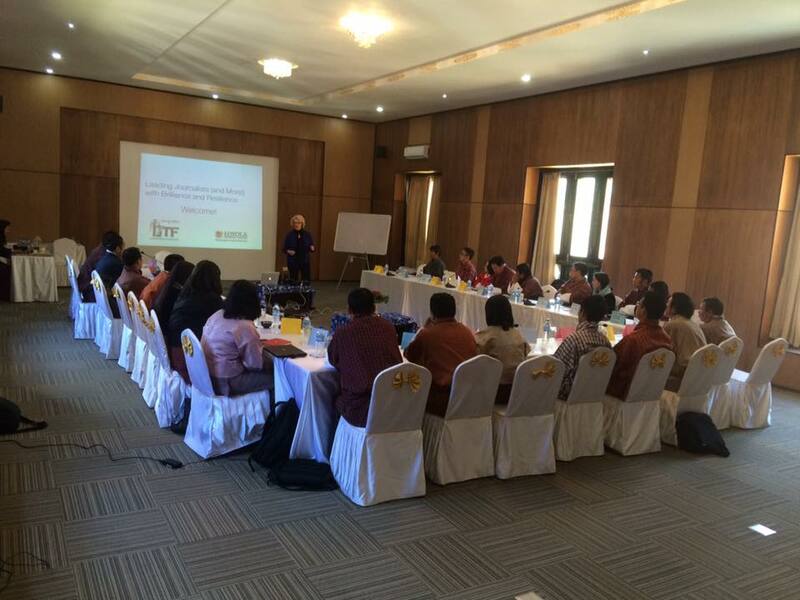 The Bhutan Media Foundation invited me to come to the Kingdom and work with editors and managers from print, broadcast and online. This would be pro-bono teaching in support of journalism in a democracy - so my own leaders at Loyola University Chicago embraced the idea wholeheartedly. Social justice is at the core of all of our teaching and this was a perfect fit. 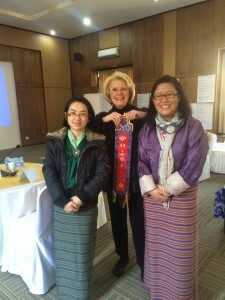 The multi-day seminar was held in the city of Paro in December of 2015. As you can see, it was a full house. We covered topics from change management to motivation to investigative journalism and ethical decision-making. I learned that some things are universal: Managers are hungry to learn how to help people improve their skills and succeed in the workplace. You may have heard that Bhutan is known for its belief in the importance of Gross National Happiness as the best measure of the country's health and vigor. What better fit for a teacher who's written a book called "Work Happy." This is Dawa Penjor, executive director of the Bhutan Media Foundation, who donned a Loyola cap and t-shirt I brought for him as a gift, along with a copy of my book. He has a passion for helping grow the quality of journalism in his country. We took two official class pictures. I had to laugh when I saw the first one. Apparently, the great group members thought they should look professional and serious for the photo. I scanned all the faces and told them they looked like we were in the land of Gross National Grouchiness! It certainly wasn't reflective of their great sense of humor and fun in our sessions. So I suggested we do another - and they feel free to be themselves! This is the result. And I must say it is a far more accurate depiction of our experience together! You may note that the class members are all wearing traditional Bhutanese dress. 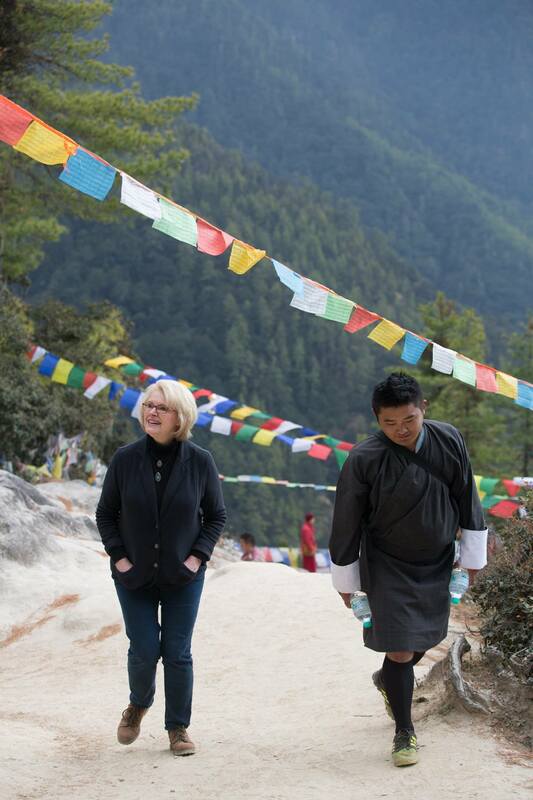 It's a requirement in Bhutan that for any important or business-related activity that men wear the "gho" and women wear the "kira." These are my friends Peky and Sonam, who surprised me with a hand-crafted wall decoration. Each of the women is wearing the kira - which consists of a bright silky jacket and long woven skirt. The kira come in a rainbow of jewel tone tops and patterned skirts, adding to the great colorful nature of the country. 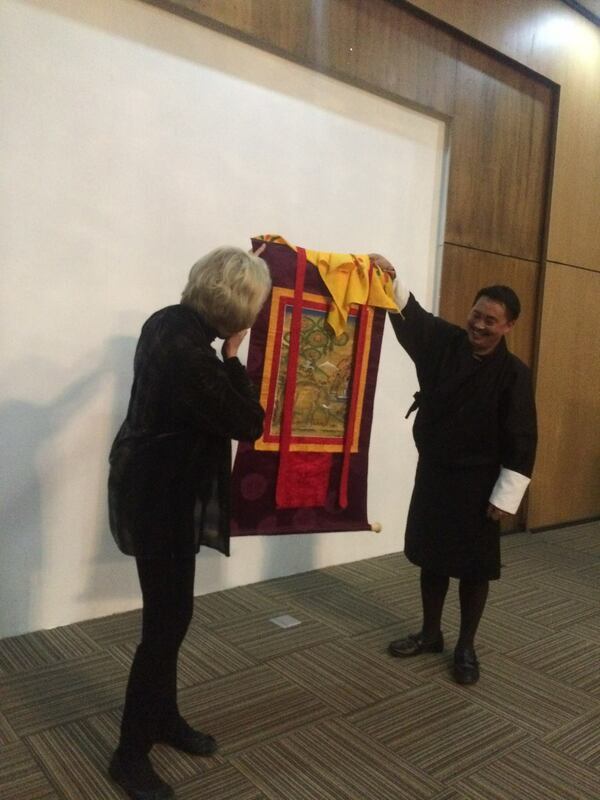 In this photo, taken at the end of the seminar, Dawa Penjor presented me with a wonderful treasure. It is a silk wall hanging of "The Four Harmonious Friends." 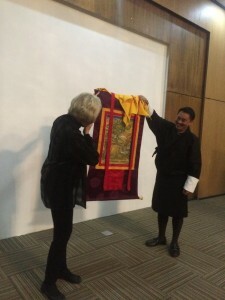 The animals depicted are part of a time-honored parable of cooperation that is taught in Bhutan and is often depicted on the walls of public places. It will now become a part of my office at the Loyola Chicago School of Communication! 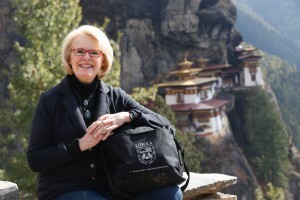 One of my seminar participants took the opportunity to interview me for the business publication at which she is an editor, "Business Bhutan." I think it is interesting that the management questions I'm asked are very much the same, whether we're in the United States or abroad. I really believe that leadership is a universal language we all want to perfect! 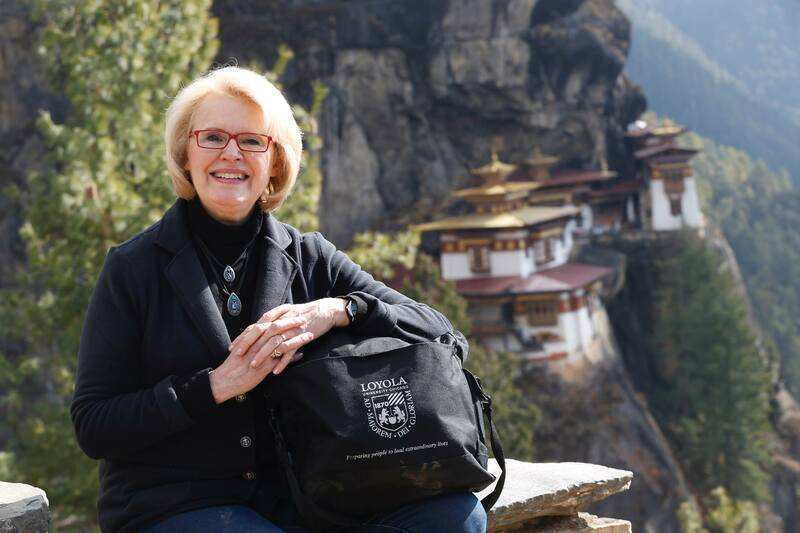 After the seminar, I took the hike of a lifetime: the trek to the most venerated spot in Bhutan. It is the Taktsan monastery (also known as "The Tiger's Nest") built into the side of a mountain, at an elevation of about 9,500 feet above sea level. The hike, which took us 3 hours each way, goes past countless colorful prayer flags placed respectfully by Buddhist citizens. 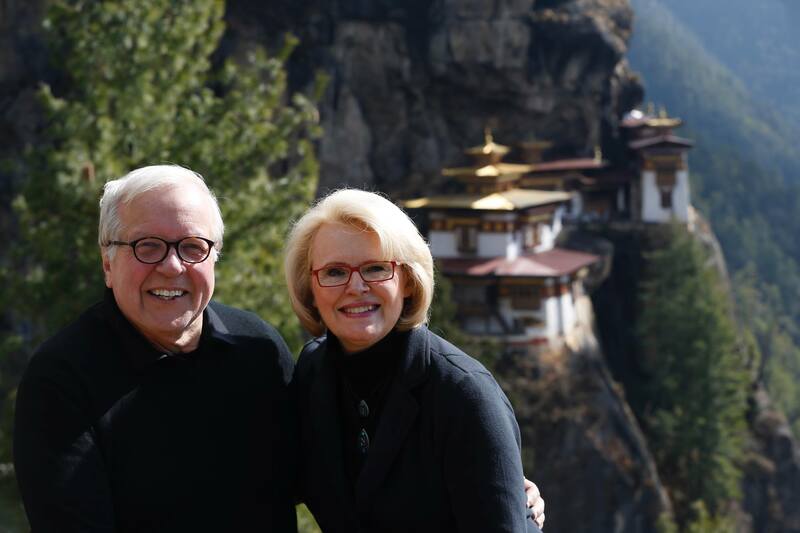 It's safe to say that my husband and I were tired -- but joyful to have had this great opportunity to see such a wonderful monument to both extraordinary architecture and enduring faith in Bhutan. If you ever have the opportunity to visit this tiny beautiful country, by all means do so! Many of the organizations in which I teach and coach have a goal: they want to upgrade the culture of their workplace. They may have done employee surveys and discovered problems or they may be aware that to be more competitive in their field, they need to make significant changes in the way people at all levels of the company approach their work. Here's my advice to leaders who want to improve their cultures. Hint: It takes more than a new mission statement. 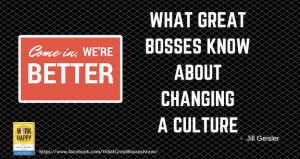 Click here for my column on changing your culture. 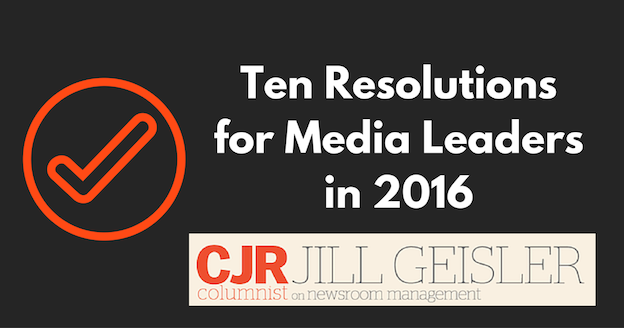 A List for Media Leaders – and More! You don't have to be a leader in the field of media to benefit from these tips. My monthly column for the Columbia Journalism Review lists ten things -- from feedback to change management to creating a culture of fun -- that can work for all professions. Click here for a link the column. Hope you enjoy! Comments Off on A List for Media Leaders – and More! May You Work Happy – and Lead the Way in 2016! 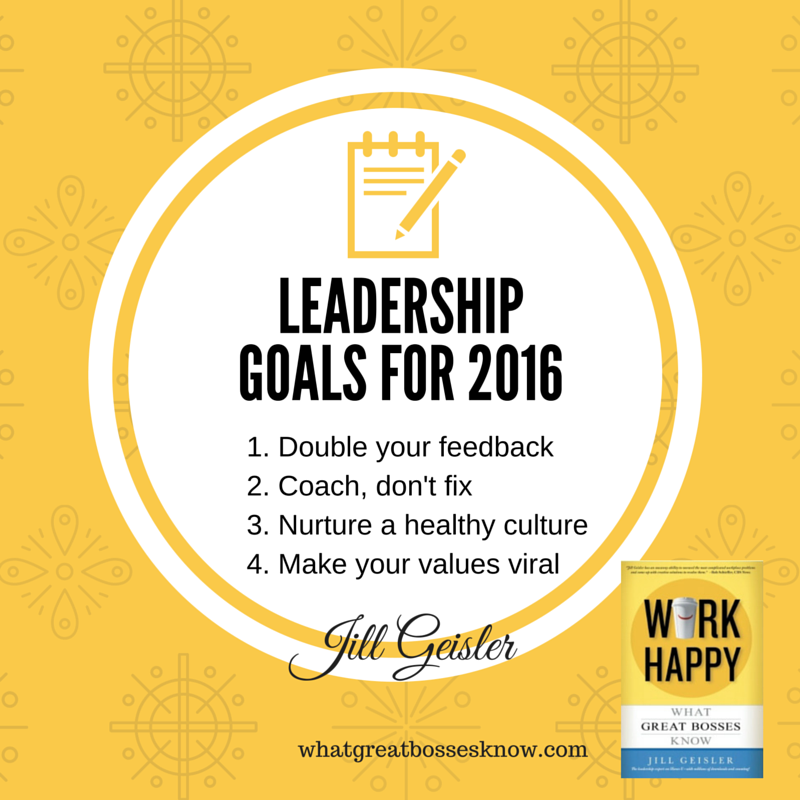 Comments Off on May You Work Happy – and Lead the Way in 2016! In today's information rich society, anyone can publish just about anything. 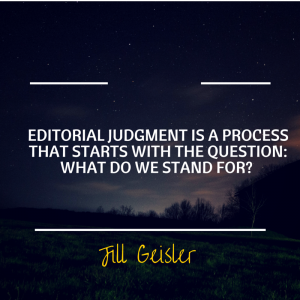 You may be an editor of a traditional publication or a private citizen using social media. When it comes to sharing highly personal information about people, how do you know where to draw the line? If you withhold is it censorship? How should you decide? I take an in-depth look at the issue in this essay for Loyola University of Chicago's Center for Digital Ethics and Policy. Just click on this link to read it.